Figure 1-20. 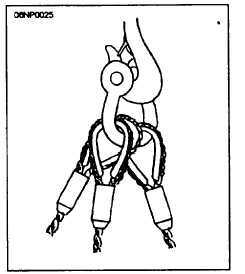 - Shackle use with two or more wire ropes. Keep hands away from pinch points as the slack is being taken up. Wear gloves when handling wire rope. 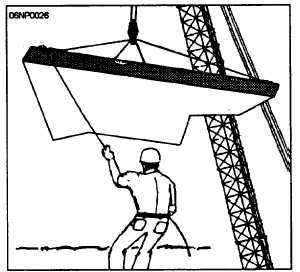 Make sure that all personnel stand clear while loads are being lifted and lowered or while the slings are being drawn from beneath the load The hooks may catch under the load and suddenly fly free. Never, under any circumstances, ride on a load that is being lifted. Figure 1-21. - Using tag lines to control load. Figure 1-22. 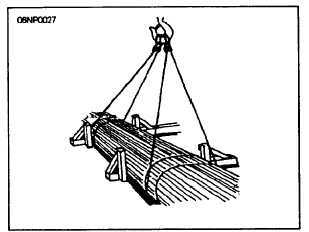 - Before loads are unhooked, they must be properly blocked. Never allow the load to be carried over the heads of any personnel. Remove or secure all loose pieces of material from the load before it is moved. Make sure that the load is free before lifting and that all sling legs are taking the load. Read OPNAVINST 4110.2 dated 20 June 1989, subject: Hazardous Material Control and Management (HMC&M). This instruction establishes uniform policy, guidance, and requirements for the life-cycle control and total quality leadership (TQL) of hazardous material acquired and used by the Navy. This instruction, unless otherwise specified applies to all Navy organizations and shore activities involved in the planning, procurement, acquisition, stowage, distribution, requisition, use, or other disposition of hazardous material (including disposal of used hazardous materials and hazardous wastes in the United States and its territories). Navy shore activity requirements in foreign countries are to comply with the requirements of host nation Status of Forces agreements if they are more restrictive than U.S. regulations. Where host national requirements are less stringent, conform to U.S. OSHA and EPA laws and regulations to the extent feasible.